The International Software Benchmarking Standards Group (ISBSG) announces the 2019 release of the Development & Enhancements software data repository. Compared to the previous release, almost 1000 projects, releases and sprints have been added. The number of new development projects, releases and series of sprints is now 9,178. ISBSG is nowadays collecting more Agile and DevOps data, as many organizations move from traditional software development methods to Agile and DevOps methodologies. These modern ways of software development are designed to deliver working software of the highest priority as fast as possible to the user. However, organizations using these methods often lack grip on their software development teams, resulting in higher cost per unit delivered. Story point metrics work fine on the team level but are not useful for management purposes. Story points is not a standard and the number of points strongly differs per team. So metrics based on story points often can’t be used for longer term estimation, team performance measurement and the other purposes mentioned above. Functional size measurement is still the only objective, repeatable, verifiable and therefore defensible way to measure the output of software development (the functional size delivered) in a standardized way. The ISBSG data of completed projects, releases and sprints, helps organizations to regain their grip on application development, regardless the development methodology used. ISBSG data helps organizations to make better decisions, based on objective data instead of subjective opinions. Through the years, many organizations have used the ISBSG data to avoid software horror stories, to select the right outsourcing partners and to support other important decisions. The 2019 repository can be purchased as stand-alone data or as part of a corporate subscription . The ISBSG is an independent, international, not-for-profit organization, based in Melbourne (Australia). It was founded in 1997 by a group of national software metrics associations. Their aim was to promote the use of IT industry data to improve software processes and products. Currently, ISBSG collects current and relevant software data from the IT industry. Its goal is to provide this data back to the industry to improve decision making based on data, not on opinions. Currently there are 2 repositories available: Development & Enhancements (now over 9000 projects, releases and sprints) and Maintenance & Support (over 1100 applications). ISBSG has released and new data collection questionnaire specifically for Agile projects. 2018 February release of the Development & Enhancement data has 169 Agile projects with new submissions to be released in 2019. Download the Agile Data Collection questionnaire and submit your projects to contribute to helping others learn about the productivity of Agile projects. ISBSG is pleased to announce that KOSMA (Korean Software Measurement Association) has joined as a Gold Partner. In Korea, KOSMA conduct research and educational projects. These are based on a variety of information-related business costs in the neutral position of the ordering organization and the contractor. At the same time, they strive to form a sound and productive information technology market. For more information, visit the KOSMA website. ISBSG is pleased to announce the new release of the Development & Enhancement data repository for 2018.. The number of new development projects, releases and series of sprints is now over 8200. ISBSG data helps organizations to make better decisions, based on objective data instead of subjective opinions. Through the years, many organizations have used the ISBSG data to select the right outsourcing partners, support critical planning decisions and avoid software “horror stories”. The ISBSG Development & Enhancement data can be purchased on its own or as part of a Corporate Subscriptions. The 2017 version of the Project Planning (Phase Ratios) report has just been released. Would you like to benchmark the effort allocated to the phases of your project? This report provides a valuable insight into the effort ratios spent on each project phase, using projects from the ISBSG Repository. Both Enhancement projects and New Development projects are discussed. Statistics for Agile projects are also included in this report. ISBSG is pleased to offer you a copy of our short report – How to Estimate the Required Team Size of Agile Teams. Read more about this offer now. The expo:QA’17 conference took place mid June in Madrid, Spain with more than 400 participants (from more than 200 different companies) that come from 22 different countries. The conference program was like a big candy store with everything that you could dream off about testing. With more than 40 presentations, Masterclasses and workshops with presenters from both Spain and international as well as a big exhibition area – the expo:QA’17 was a big event. 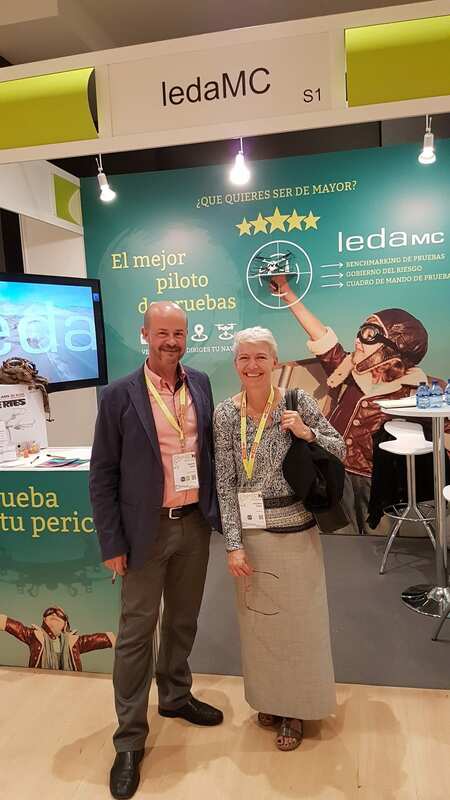 LEDAmc – a Gold partner of ISBSG – was sponsor at the conference and was well represented both in the exhibition area and as a presenter at the conference. Christine Green –ISBSG Board member was invited by LEDAmc to promote and share the ISBSG purpose and products. LEDAmc’s presentation differ from other presentations at the EXPO:QA due to the fact that it focused on the performance and estimating of the testing as a service or separate project using benchmark data. At the EXPO:QA exhibition LEDAmc booth the promotion and communication about both ISBSG and LEDAmc’s usage of benchmark data continued. A lot of participants at the conference went by the LEDAmc both to both hear more.